I'm puzzled by the 180 tonne figure just used for the BFS. I'd have thought it required a lot, lot more. Back to the reality of initial scientific/exploratory missions. Its easiest to import hydrogen in the form of liquid methane and simply ISRU the oxygen. Another portable (and non cryogenic) form of hydrogen is common ammonia which is 17% hydrogen by mass and has a room temperature density of 0.73 tonne per m3. In terms of density, liquid methane is 105Kg of hydrogen per m3 and ammonia is 129Kg of hydrogen per m3. Plus it is a source of nitrogen. I'm sorry, I just don't see or support the argument for importing ammonia or liquid methane to the martian surface. This discussion is a distraction, IMHO. Yes, you can transport various gases there in stable forms. And if you do, you are taking many trips to the surface all the way from Earth to collect the necessary ingredients to return once. Until you send up ISRU equipment, you are stuck in this unsustainable and uneconomical paradigm. The necessary gasses are already on Mars in various forms. Identify the path for extracting each (the purpose of this thread), and send the required ISRU equipment instead on early missions. Curiously your illustration is of MOXIE, which creates Oxygen only. It doesn't generate Hydrogen. Getting ISRU Hydrogen is going to be costly (imported machinery, energy requirements etc) and I've yet to be convince that this really, actually is easier than simply importing Hydrogen. Moreover, the more successful we are at sending rocket fuel into Earth orbit cheaply, the less the mass of imported Hydrogen actually matters. I would argue that the mass of Hydrogen that has to be landed on Mars surface is going to be small compared to the mass of all the other one-way equipment and consumables that are going to be needed to sustain small scale missions. What are you talking about? 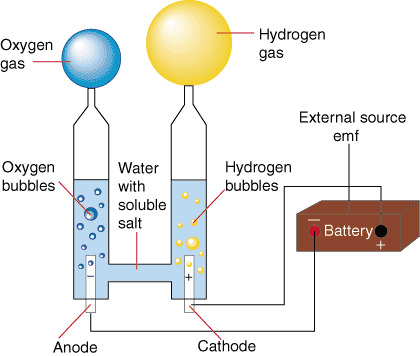 The hydrogen comes from electrolysis of water. If the colonists have access to water, electricity, and a high school chemistry set, they can make as much hydrogen as they want. along with melting the ice, dealing with the phase changes from solid to gas, etc etc as the glacier "is tapped" the 10 meters or so above it is going to have continual stability problems. as the ice is drawn down the mass of the dirt above it is going to "sink" and I am unclear as to the mechanism for heating the ice as the ice is drawn down. its not a trivial excersize. In comparison our wells are. All are completely solar powered and other then the yearly inspection for the county require little or no maintenance. we are in my view a long long way from using local resources on Mars or the Moon. MOXIE is electrolysis of CO2, not water. Electrolysis of water is easy. Getting water isn't. And let me make it clear since I've said it before. I don't have a problem with obtaining water on Mars for domestic purposes (drinking, growing plants). What I have a problem with is the idea of obtaining water in the quantity needed to produce rocket fuel. I also have a problem with the idea of colonisation, but that's another story. Realistically there will be small scale scientific/exploratory missions to Mars. These missions won't need to produce Hydrogen for rocket fuel. They may need to find small quantities of water. To that end, there is enough water vapour in the atmosphere for the purpose. Using local resources is required for reasonable mass of the ship to Mars. I worked a while ago figuring out the BFS life support system. I'll include my results in the joined files. In the absence of a large body of water for cooling, I suggest a closed loop of HDPE or PVC piping in large mats on the surface, with circulating Glycol or ammonia. We would need to ensure the plastic chosen did not have a glass transition phase. Similar mats are used on Earth for geothermal work. Even better, you might use algae filled plastic bags, combining cooling with organic matter production. So extra heat from fuel production is used purposefully. BTW I'm very open to suggestions for improvement on these documents!! Are you saying here that BFS needs an external radiator when parked on the Martian surface? Almost certain. BFS will be well insulated because of the thermal requirements of re entry. There will be a number of internal heat gains, (people, lights and equipment), in particular the CO2 removal systems create heat. So getting the heat out will be a big problem. Any significant fuel production will generate a lot of heat, and that certainly requires radiators. you can look to the Space Shuttle as an example, or the Apollo command module. Apollo did on the moon. But the good news is that whatever they used in cruise phase can be used on Mars if engineered to work under gravity. Using sunlight and CO2, both of which are available on Mars, the have doubled the oil production algae can produce. The oil can be run through a traditional refinery. This might open the production of RP-1 on Mars creating another option for ISRU propellant production. From the article: “The major inputs for phototropic algae production are sunlight and carbon dioxide, two resources that are abundant, sustainable and free,” said Oliver Fetzer, Ph.D., chief executive officer at Synthetic Genomics. Algae-based oil might be more valuable as a feedstock for plastics than as fuel, especially given that most rockets proposed for Mars are methalox-based. No, not efficient enough. Pressurized windows are actually more expensive than solar panels. I have next to me a pressurised window that cost me $10/m^2, and is good for several years at >50PSI. It is a 2l cheap lemonade bottle. You might want to lay a UV protective/greenhouse layer of film over the top of this, but pressurised windows, while they can be expensive, can also be inexpensive. Algae can be grown in pipes or hoses. About the cheapest pressure vessels imaginable. Over that span a plastic sheet that keeps UV out and infrared in. Not pressurized just pushing enough air in to keep it up. In an interesting boostrap application is the manufacture of carbon composite piping for use in this expansion of water, methane, and oxygen is that these products can be used to make the carbon fiber and other chemicals to make pipe with some other elements the but primarily from the main three. So the initial would be to ship the chemical factories to manufacture from the output of the prop factory the propylene which is the basic building block for both carbon fiber and other plastics. Also to ship the composite pipe manufacture equipment with carbon fiber spools plus the resins vs using up a lot of valuable cargo BFS volume for low weight pipes. This allows for the manufacture of pipes custom made for the found situations (diameter and lengths + elbows, fitings, etc.). Plus this same feedstock with other carbon composite end product manufacturing equipment such as habitat containment which can also be customized on site to conditions. Ship the manufacturing equipment and initial feedstock for the colony to be able to custom make it's pipes and structures and not ship the the pipes and structures except a very small amount in the initial setup. Bootstrapping is the name of the game. Ship the equipment to manufacture the products from the ISRU. The reason I mention this in this thread is the importance of customizing the piping for the situations found. This allows for more mass efficiency of the shipment from Earth. Because you do not need to know specifics many years earlier to be able to ship the stuff needed once the cargo BFS arrive on Mars. This shortens the delay from discovery to exploitation by as much as 1 to 2 years. Algae-based oil can be used for all kinds of lubrication and electronics needs, not just plastics production. I think we'd see algae-derived plastics and chemicals manufacturing loooooooooooooong before we see anything like metals refining and parts fabrication on Mars. And once you have plastics production, you can make just about any static item that doesn't have to survive ultra high temperatures. "The algae grow by absorbing the carbon and producing a starch that can be used as a raw material for bioplastics or binding agents. The waste product is oxygen, clean air." Photovoltaics are STILL cheaper. Solar cells, about 20-25% efficient (versus like 1 to 5% for photosynthesis), are about 10.5 cents per watt right now on the spot market. So that's $25 per square meter, or normalized to the efficiency of your PET bottle photosynthesis, about $1-5 per square meter. (solar cells also need a thin protective film and mounting, but comparable to yours... and still simpler since maintenance is about zero.). You can only normalise to the efficiency of PV vs photosynthesis, if you are not going to use that power for a greenhouse, and are not growing some sort of edible algae. In principle, biosythetic oil could be part of the diet. But interesting if you're not using it for this. Much more efficient to convert the electricity into methane (and ammonia, using hydrogen and nitrogen) and then feeding that to single-celled bacteria to produce protein. Is there any good pathway from artificial photosythesis to more conventional foods? I was interested in particular in "cyborg plants", ie instead of leaves you graft them onto something that just delivers the same sugars or whatever it is they get from leaves.. but otherwise standard plants producing things we recognise.